In the mid 1980s I spent much of my spare time looking at old instruments which came through Monday Lunch,a shop on Magdelen Street in Norwich which sold the bizarre combination of kites and second hand musical instruments. A rather battered unmarked five keyed boxwood clarinet caught my attention. The speaker key and the e flat keys were missing and the holes blocked up, but the chalemeau register sounded gorgeous. The shop wouldn't part with it, but I did manage to photograph and measure it. I am now in the advanced stages of making a copy of this beautiful little instrument. Having the information available and appropriate sized boxwood blank, I was spurred on to make a copy of the smallest tabor pipe found on board the Mary Rose; Henry the eighth's flagship which sank in the Solent in 1545. This exquisite little insrument has a more gentle tone than the modern pipe used for morris dancing and it seems to me that it would make a suitable accompaniment to a string drum like the basque "ton-ton" or the legendary "buttafouoco" of the Italian rennaissance. The pipe has a range of an octave and a sixth and is pitched slightly flat of G at A440. As a musician in a revival west gallery band I have become aware of the lack of authentic bassoons out there. In inventories of old west gallery instruments bassoons were one of the most common bass instruments used, rivalling the 'cello in popularity. I have decided to try and put the matter right myself and with the help of John Hanchet I am working on copies of a late eighteenth century bassoon by the French maker, Rust. It will play at A440Hz in order to be compatible with other west gallery instruments and will have up to seven keys. The first two should be ready by summer 2008. It was a long time ago that I first thought about making penny whistles out of more "up market" materials like boxwood with horn mounts and I will soon have some in stock. They are pitched in c,d and e flat and use the same sized head for each pitch so that I can offer them in sets, three bodies in c,d and e flat and one head to fit all three. Currently the bodies are of plum and the heads are box with a horn mouthpiece. I also carry out repairs to antique woodwind instruments. 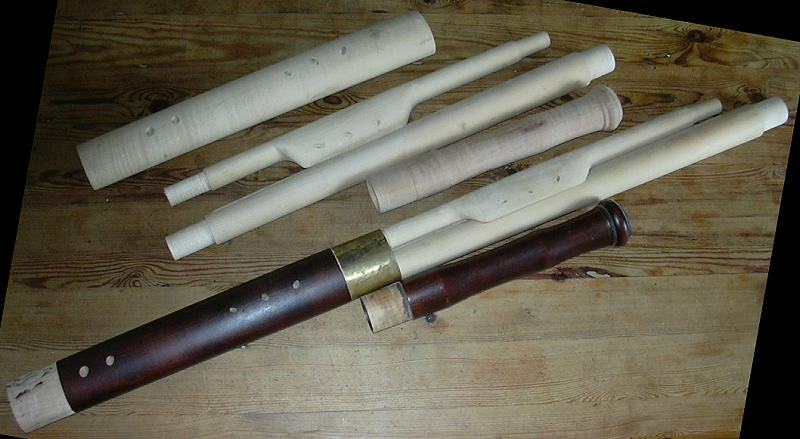 Enquiries are welcome for traditonal East Anglian dulcimers and one keyed flutes (all historical pitches considered).